Manicure- Sit back and relax. A deluxe manicure will include a lovely hand massage, followed by a deep cleansing treatment and hand and nail soak. 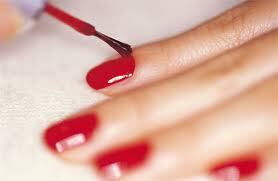 Your cuticles will be treated and your nails will be shaped and polished with your desired colour. 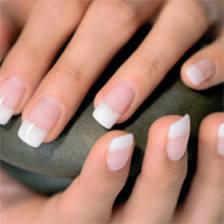 You can choose a French polish if you wish. Pedicure- Similar to a Manicure, you will enjoy a relaxing foot spa with oils, followed by and light removal of dead skin from the heel and soles of your feet. 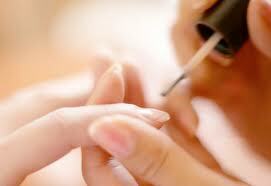 Your cuticles will also be treated and you toe nails shaped and painted with your chosen colour. You can chose a French polish if you wish. Gel Nail Polish- This is the new revolution and the next generation of manicure and pedicure. 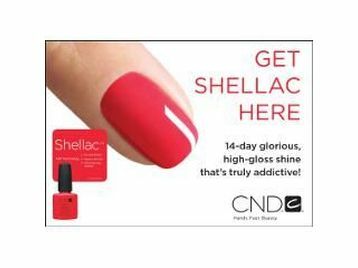 Gel UV polishes are hard wearing and offers you chip free nails. There is a variety of high gloss colours and with a quick 10 minute removal time as and when you so wish. You will also receive a mini manicure to complete your treatment. Nail Wraps- Nail Wraps are one of the latest trends to hit the nail industry. These fantastic foils come in a huge variety of designs and will last you for weeks. The treatment will start with a dry manicure or pedicure. The nail wraps can then be applied to both natural and extended nails. It is a look to really make your nails Wow! Callus Peel- A Callus Peel will leave you feet feeling soft and beautiful in around 15 minutes. The feet are treated with the cream wrapped in a bandage type material and left to cook in what looks like a plastic bag. The dead skin is then removed and scraped away leaving a great soft smooth feel. Mini Manicure or Pedicure- This will include a file shape and polish of your chosen colour. French polish can be chosen. At a £2.00 extra charge.